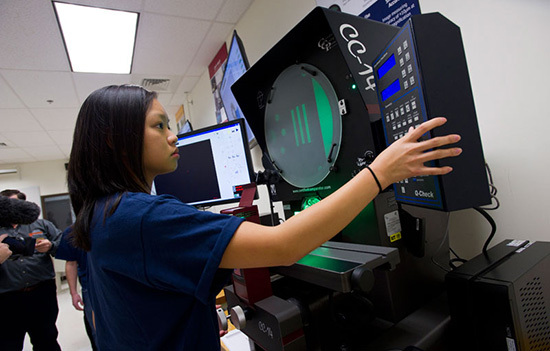 Jasmine Phan, a fourth-year mechanical and manufacturing engineering technology student, prepares to demonstrate QVI metrology equipment in the Metrology Lab located in RIT’s College of Applied Science and Technology. It will be one of the labs participants can tour at Plastics Night, taking place on April 12. Plastic is used for more than bottled water. Current research in new plastic and polymer-based materials for applications such as photonics, construction and mechanical systems will be featured during Plastics Night at Rochester Institute of Technology. The event takes place from 5 to 7 p.m. on Wednesday, April 12, in the Golisano Hall Atrium at the university. It is free and open to campus and the general public. More than 200 members of the professional and student chapters of the Society of Plastics Engineers are expected at the event that will include undergraduate and graduate student research projects and tours of the various labs in RIT’s College of Applied Science and Technology, the event sponsors. Some of the current applications for plastics and polymer engineering technology include health care, food services and civil engineering/construction. RIT’s faculty and student researchers will present information on topics such as adhesives for use in photonic applications and polymer-based packaging material strength and usage. Participants will also be able to tour the Plastics Lab and the QVI Metrology Lab, both located in Golisano Hall. According to a recent report by the Plastics Association, the industry remains the country’s third-largest manufacturing sector overall, accounting for more than $418 billion in shipments in 2015 and nearly 1 million jobs. The industry trends include research into more sustainable materials and broader usage for products such as concrete, solar arrays and prosthetics, for example.